'Mingus: Jazz In Detroit' Catches A Giant At A Moment Full Of Possibility A newly released recording of a 1973 concert opens a window into the volatile bassist's career at a moment of transition, but also a compelling and largely unknown chapter in Detroit jazz history. Charles Mingus poses next to a poster for his six nights of performances at the Strata Concert Gallery in Detroit in 1973. A recording of one of those nights has just been released. Detroit. Feb. 13, 1973. A Tuesday night. The Charles Mingus Quintet opened a six-night stand at the Strata Concert Gallery, a former photography studio at 46 Selden St., on a gritty street in the shadow of then-abandoned Orchestra Hall. The venue — an offshoot of the musician-run Strata Corporation — attracted aficionados and musicians. WDET-FM, the public radio station affiliated with nearby Wayne State University, broadcast the music live. The Strata Concert Gallery, which showcased a jaw-dropping roster of acts, from Herbie Hancock's Mwandishi sextet to Ornette Coleman, was the epicenter of the scene for Detroit's most progressive musicians and audience. Mingus had not appeared in the city since September 1969, when the volatile bassist, composer and bandleader substituted for an indisposed Thelonious Monk at Baker's Keyboard Lounge. Mingus' last club engagement in Detroit before that was in 1960. No wonder folks had been buzzing for weeks in anticipation. "For Mingus to be here was special," said veteran Detroit guitarist Ron English, who was present the night of the recording. "He represented what we aspired too — that kind of creative freedom. That was the kind of music we wanted to make." 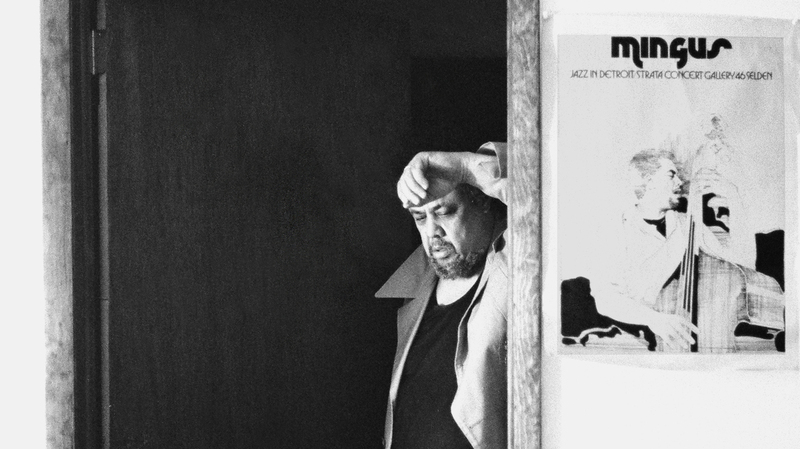 Mingus: Jazz in Detroit parachutes listeners into a one-nighter in 1973. But beyond jazz verité, the performances — sometimes spectacular, sometimes ordinary — open a window on a compelling and influential chapter of Detroit jazz history that remains unknown to most of the wider jazz world. The Strata Corp. looms large within the city's cultural mythology, even though it lasted just seven years, from 1969-76. Founded by pianist Kenn Cox and trumpeter Charles Moore, the organization included a record label, a performance space and other activities. Strata put a unique Detroit spin on the self-determination and collectivism that were part of the era's zeitgeist. Mingus himself arrived at the Strata Concert Gallery in transition, emerging from a fallow period. He was gathering string, building toward his last great band that coalesced in late 1974 with George Adams, Jack Walrath, Don Pullen and Dannie Richmond. Only Pullen was aboard on piano in Detroit. Otherwise, the quintet, which never recorded commercially, included trumpeter Joe Gardner, tenor saxophonist John Stubblefield and Roy Brooks. The repertoire combined Mingus evergreens ("Peggy's Blue Skylight," Pithecanthropus Erectus," "Celia," "Orange Was the Color of Her Dress, Then Blue Silk") with the lesser-known "The Man Who Never Sleeps" and a true rarity, "Dizzy Profile," plus some extended blues jams. Mingus, who had brazenly helped start Debut Records with his wife, Celia, and drummer Max Roach in 1952, must have harbored admiration for what the Detroiters were up to with Strata. Its founders Cox and Moore, both born in 1940, plotted an organization that put musicians in control. They created a corporate model, believing a for-profit structure was the best way to support their artistic goals. They issued stock to raise capital and formed a company with three divisions to produce concerts and recordings, publish music and manage, book and market artists; there were plans to develop satellites across the country. They took their name from pedagogue Joseph Schillinger, who used "Strata" to refer to layers of compositional elements. Strata bubbled up from the streets as part of a wave of self-determination efforts across the country in the 1960s and '70s, among them the Association for the Advancement of Creative Musicians in Chicago and the Black Arts Group in St. Louis. There was also a lineage of collectivism among Detroiters that stretched back to the New Music Society in the mid '50s – Kenny Burrell was president – and later included the multidisciplinary Detroit Artists Workshop (1964-67), Detroit Creative Musicians Association (1967-69) and Tribe (1971-77). Strata grew directly out of the Contemporary Jazz Quintet, the most celebrated Detroit jazz band of the period. The CJQ – Cox, Moore, tenor saxophonist Leon Henderson (Joe Henderson's brother), bassist Ron Brooks and drummer Danny Spencer — explored the up-to-date harmony and shifting meters of the Miles Davis Quintet. The Detroiters recorded two LPs for Blue Note in 1968-69 but grew increasingly frustrated with producers Duke Pearson and Francis Wolff, who refused to fly the CJQ to New York to record and rejected the band's ideas about performance lengths, segues and sequencing. Cox and Moore responded by creating Strata. The company's audacious vision merged capitalist fundamentals, do-it-yourself grit and utopian confidence in artists. Cox, who died in 2008, served as president, Moore, who died in 2014, was executive vice president and an accountant friend handled the books. Nobody took a salary. Unfortunately, strong community enthusiasm never translated into enough working capital and Strata struggled with cash-flow from day one. Leaders spent years pursuing a federal Small Business Administration loan that never materialized, and Strata shut down in 1976. Before then, though, Strata produced concerts for four years and released a handful of LPs. It created the first courses in African-American music at the Oberlin (Ohio) Conservatory. And it energized the Detroit scene and inspired others to action — including Charles Tolliver and Stanley Cowell, whose Strata-East label grew out of meetings with the Detroiters. A partnership was discussed, but the New Yorkers, wary of Strata's corporate structure, decided to go it alone. But, as Tolliver told me, they kept the name Strata-East to honor the shared values of self-determination. Strata-East focused narrowly on recordings, adopting a model in which artists financed production and manufacture of their own records and retained ownership of the master tapes. The company released roughly 50 LPs between 1971-82, many by nationally known artists. In contrast, prohibitive upfront costs prevented Strata from releasing its first LP, the CJQ's "Location," until 1973. Ultimately, only five records were issued before Strata ceased operations, though five more were in the pipeline. In July 1970, Strata had put down roots at the original Strata Concert Gallery on Michigan Ave., not far from old Tiger Stadium. In 1972 it moved to Selden Street, operating until 1974. Strata started a non-profit wing to secure state arts council funding to help underwrite performances, and there were multi-night engagements by such heroes as Coleman, Hancock, Chick Corea, Joe Henderson, Sam Rivers, Weather Report, McCoy Tyner, Elvin Jones and Archie Shepp. WDET aired some performances, and a bootleg of Hancock's Mwandishi broadcast a week after Mingus' appearance has circulated widely, even showing up on YouTube. Alas, others have not yet surfaced. All of which makes the Mingus tapes even more significant. The material owes its release to Amir Abdullah, a DJ and producer based in Brooklyn and Berlin, whose crate diving and enthusiasm for Strata Records has led to a spate of reissues on his 180 Proof label. Four of the five LPs released by Strata in the '70s and four of the five LPs still in the can when the label folded have been restored to circulation. Abdullah learned during his research that WDET reference tapes of the Mingus broadcast were in the possession of Roy Brooks' widow, Hermine. Despite the breathless marketing pitch referring to "long-lost" tapes, the whereabouts of the Mingus material was known to insiders in Detroit. But major props are due to Abdullah for rescuing them and securing their release. The fidelity is crystal clear, and many of the tracks stretch to between 20 and 30 minutes. Mingus' quintet is at its focused best during the night's long first set. The frenzied intensity of "Pithecanthropus Erectus" never lets up over 25 minutes; the extended modal sections climax with apocalyptic wails and broken rhythm. Stubblefield's bubbling tenor covers the spectrum, from blues shouts to sleek post-bop lines and incantatory screams egged on by Brooks' roiling drums and Pullen's splashy piano. The band reaches a similar peak on "Peggy's Blue Skylight," a typical Mingus intersection of delirious lyricism and near chaos. Pullen, consistently thrilling throughout the night, is all over the keyboard. His cascading glissandos and tone clusters merge seamlessly into swinging straight-ahead lines. On "C Jam Blues," Pullen even channels his inner Wynton Kelly and Ahmad Jamal. Little-known trumpeter Joseph Gardner, misidentified in the liner notes as a native Detroiter, is a mixed bag. He has an attractively dark if buzzy sound but only fair technical skills. He also doesn't play chord changes that well. On the second set's "C Jam Blues" and "Orange Was the Color of Her Dress" he simply lands on too many questionable notes and fluffs others. Still, he transcends on "The Man Who Never Sleeps," conjuring a soulful expression at one with Mingus' lovely song. "Dizzy Profile," a sweet waltz Mingus wrote for Dizzy Gillespie and introduced just weeks earlier at Carnegie Hall, is played twice during the evening. These are the only recordings of Mingus performing it. Gardner rallies on the second version, delivering a more assured reading. After the first set, the band's energy and focus comes and goes. The hook-up between Mingus and Brooks isn't always steady — maybe by then only Dannie Richmond could lock in completely to the bassist's fickle time feel — but when everything clicks, the music soars. Mingus testifies with amen righteousness on "Noddin' Ya Head Blues" and then yields to a wild Brooks improvisation on the musical saw. A more judiciously curated 2 or 3-CD set would have made a far stronger impact, but it's a gift that these tapes survived for what they tell us about Mingus — and Detroit. Detroit-based journalist Mark Stryker's book, "Jazz from Detroit," will be published by the University of Michigan Press on Aug. 1, 2019.